Nikolay Zheludev, PhD, DSc, FRS is Professor of Physics at the University of Southampton (UK). 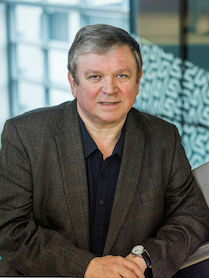 He is Deputy Director (Physics) of the Optoelectronics Research Centre, University of Southampton and direct the Centre for Photonic Metamaterials at Southampton and the Centre for Disruptive Photonic Technologies at NTU, Singapore. He is also Adjunct Professor at IMRE (A*STAR). Prof. Zheludev received MSc, PhD and DSc from Moscow State University and joined the faculty at Southampton University in 1991. His awards include a Senior Research Fellowship with the Leverhulme Trust (2001), a Senior Research Professorship of the UK Engineering and Physical Sciences Research Council (2002) and the Royal Society Wolfson Research Merit Award (2009). Professor Zheludev is Fellow of the Royal Society, the European Physical Society, the Institute of Physics (London) and the Optical Society. Professor Zheludev is the Editor-in Chief of "Journal of Optics" (IOP Publishing) and Advisor to the Nature Publishing Group.